How will Keith Thurman pair-up against Pacquiao or Mayweather? By Jaime Ortega: Keith Thurman after convincingly out-pointing Shawn Porter with accurate counter-shots, has come under criticism from a certain faction of the boxing scene who accuse the Floridian for setting a poor performance in the ring, thus exposing his real flaws. To start, I would like to point that Shawn has the highest pressure ratio of any boxer in the game. He is very athletic and has decent boxing ability that includes a good chin. No fighter today, would be able to knockout Shawn or calm the tempest he brings in the ring. His style of fight, does not allow for high IQ boxers to think and forces them to run and hide behind the ropes. If you fight Shawn, is the equivalent of Marcos Maidana in Super-Saiyan version. What Keith did to Shawn, neither Pacquiao nor Floyd Mayweather could capitalize ever more effectively. If Keith can’t knockout Shawn, neither will Pacquiao nor Floyd – It’s that simple. Floyd had a hard time with Maidana in the first bout, he was out of his comfort zone, and didn’t look sharp and disappointing at times. Did that meant that Floyd was not a skillful fighter? No, what it meant is that high pressure fighters pose a problem to any technical boxer – and Maidana as I stated above is not better than Shawn and definitely not more athletic. Keith Thurman has recently called out Pacquiao and Floyd to step up to the ring and fight. If Pacquiao, indeed takes the Adrian Broner bout in the 140 division, he could potentially fight Thurman. However, I don’t expect Bob Arum to convince Pacquiao to take the fight. The Filipino is not in fight shape, and he is too busy dealing with the politics of his province (Sarangani). June 22, Pacquiao took President Rodrigo Duterte’s oath for a high administrative position in congress. So despite the hype involving his comeback, it is not feasible that he returns to the boxing scene with other higher responsibilities at hand —too many distractions could cost him another Juan Manuel Marquez knockout. Let’s pretend, Thurman hypothetically fought Pacquiao. What would we expect? Well before we get into the results let’s look at the details. Thurman unlike many other boxer-punchers characterizes his style with his uppercuts. Thurman has never lost the uppercut war against any boxer, he times his uppercuts very well and packs power in both hands. Thurman knows how to box in the pocket, and knows how to fight in the outside. He also can fight backwards, a skill that most people undermine. He has speed and knows how to counter those that counter him. Pacquiao also knows how to box, but Thurman’s power would present real problems for the Filipino slugger. Pacquiao times his punches and waits to rush inside with his quick feet. Thurman’s weakness is that when he lands punches, he also gets exposed to debris; which could pose a problem for Thurman since Pacquiao lashes in and out quickly to avoid counters. However, Pacquiao also opens up for shots, and all it takes from Thurman is one good shot to knock him out cold. If Thurman uses the Jab, and utilizes his full reach advantage he could frustrate the Filipino, possibly ending in KO. Much has been said about Floyd coming back to fulfill his 50th fight to surpass Rocky Marciano’s record. For those who don’t know yet, Ricardo El Finito Lopez 51-0-1 holds the undefeated record. Hint: Undefeated records bellow 51, don’t really mean much for real boxing aficionados, considering a few old school boxers took well over 200 professional fights during the Golden Era of Boxing boxing an excess of 12-15 times a year with no breaks — but been undefeated today, is the signature fad and a big deal for supremacy. If Floyd comes back he will most likely take on Danny Garcia. GGG is way too big for Floyd. I really believe Danny is an underrated puncher and boxer. He has a granite chin. He throws well timed combinations. Perhaps his least impressive fight was against Mauricio Herrera, who I personally thought out-pointed the Philly-Rican. But then again, Floyd also lost his first bout against Jose Luis Castillo with an unimpressive victory. Its life, things happen. Yet against Floyd, I don’t see how Danny could win. Danny is flat-footed, he launches combinations mostly on the outside, but also can get inside. However, he lacks the fundamentals of mobility to catch Floyd by surprise, who is arguably the best defensive fighter in the past 50 years. Floyd times his jab very well. He also knows how to set traps almost better than anyone. He also knows how to hold and slow down any boxer to then break them down. It would certainly be an interesting fight, but Floyd comes on top via unanimous decision. Against Keith Thurman, Floyd would be under a lot more danger. Thurman’s style is identical to Erik Morales in some aspects, but has a few major differences. In my opinion, Floyd would have beaten Morales in his prime because unlike Floyd, Morales was not naturally a full gifted welterweight before the Grad Rapid prodigy vacated the 140 division after fighting Jesus Chaves. But in the technical aspect it wouldn’t have been a breeze on the park fight for Floyd, it would been hard since Morales was no slouch and had excellent boxing pedigree. The legend speaks of the sparring session in 99 in Palo Alto, California where both went toe to toe and Floyd lost, and got frustrated. Floyd will have a hard time stopping the highly explosive and volatile punches that Thurman launches almost without warning. Thurman is unpredictable in that he rushes forward with fast vicious combinations to then step back and wait again. There is no doubt that Floyd would counter Thurman because the Floridian opens up in many of his counters. Floyd would not allow Thurman to impose his rhythm testing the waters early in the first rounds, but at 40 years of age, problems will arise for the now retired boxer. Floyd does not possess the power to stop Thurman, whereas Thurman all it takes is for one punch to materialize the fight and rock Floyd into the canvas. 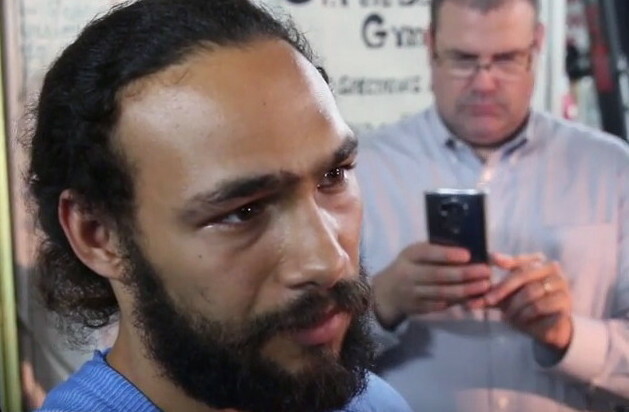 Another problem is that Thurman unlike Danny, is highly mobile and has a tendency to spark uppercuts out the blue-sky, which would pose a serious problem for Floyd. Those who think that Floyd would easily read Keith’s combos are up for a rude awakening — Ben Getty worked with Sugar Ray Leonard, and Dan Birmingham trained the likes of Winky Wright, and both trainers have crafted Thurman to be the WBA champion he is today. He is a highly versatile boxer that can adapt and mutate, unlike most boxers. Kell Brook or himself, instead of always fighting catch-weights.” The uppercuts would ultimately dismantle Floyd and brake him down via knockout. Keith’s greatest challenger might be Errol Spence Jr. who is still to prove himself and will be facing Leonard Bundu. I would like Errol to fight Diego Chaves instead, who is without an opponent and might be facing Miguel Cotto soon. Errol vs Chaves would show how good Errol really is — Chaves would give Errol hell, who without a doubt could had chosen the Argentinian over the Italian Bundu — perhaps the same reason Kell Brook dropped the fight against Chaves. Sammy Vasquez, who many fans sleep on, would also be a good test for any welter as he is no bum; he would give Errol a good fight, as he did during their trilogy in amateurs. Those who say that Keith ducks Errol who currently holds no belts, should also know that Errol took on Bundu when he could have faced a harder challenge with Sammy Vazquez or Diego Chaves. Double standards! The welterweight division is stacked, with the likes of Jessy Vargas, Kell Brook, Konstantin Pomonarev, Sammy Vazquez, Errol Spence Jr., Amir Khan, Keith Thurman, Shawn Porter, Danny Garcia, Saddam Ali, Diego Chaves, Frankie Gomez, David Avanesyan, Timothy Bradley and the possible addition of Terrence Crawford, Viktor Postol and Eduard Troyanovski. Whomever comes on top in the welterweight division should by default be set ahead in ranking over Pacquiao and Mayweather, considering the high quality and competitive streak surrounding the division not seen in the 00’s. Ducking opponents today will be harder and full unification would prove very tough to achieve in the welterweight class — a legend will emerge from this era — it might not be the Golden Era, but I call this era the ‘Golden Glove Renaissance’ because for once we see serious competition emerge again in all weight classes– boxing needed it. Boxing » Keith Thurman » How will Keith Thurman pair-up against Pacquiao or Mayweather?